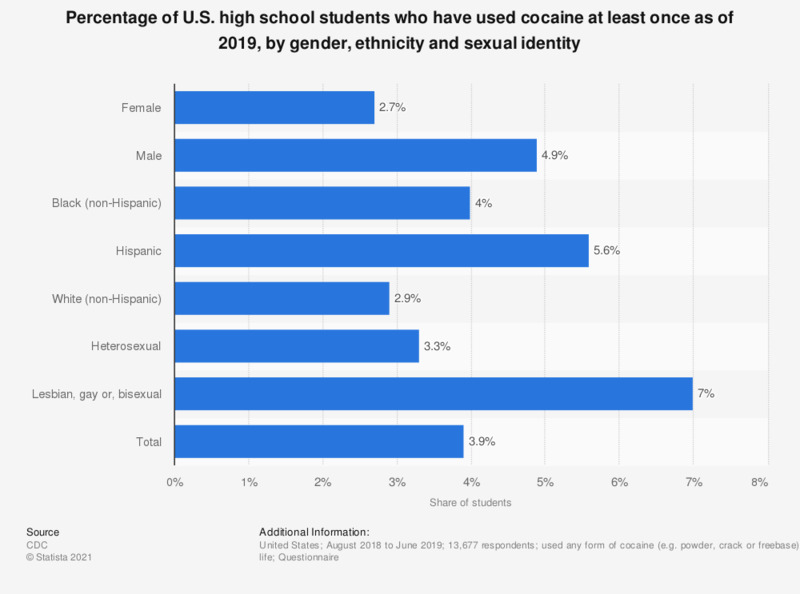 This statistic shows the share of American students in grades 9 to 12 who stated to have used cocaine at least once in their life as of 2017, by gender and ethnicity. According to the survey, 8.1 percent of male student respondents with a Hispanic background stated they have been using a form of cocaine (e.g. powder, crack or freebase) one or more times during their life. The source defines cocaine use as "used any form of cocaine (e.g. powder, crack or freebase) one or more times during their life." How safe or dangerous is it for a person to use cocaine? Where are you most likely to go to find information about your graduation options? When do you think a school program teaching children respect of differences and equal opportunities between men and women should be introduced?